As present NYC Public Advocate Letitia “Tish” James prepares to leave her post, those who are looking to succeed her are meeting with community leaders and activists to hear local issues and concerns. 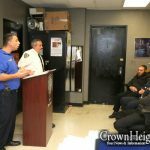 The meeting in Crown Heights was organized and hosted by Rabbi Yaakov Behrman, a community activist and director of Operation Survival. Jumaane Williams, a present councilman for the 45th District in Brooklyn, and candidate for NYC Public Advocate, came to Crown heights Sunday evening to meet with local community leaders. Present at the meeting was Rabbi Shea Hecht of NCFJE, who opened the meeting with words of Torah. 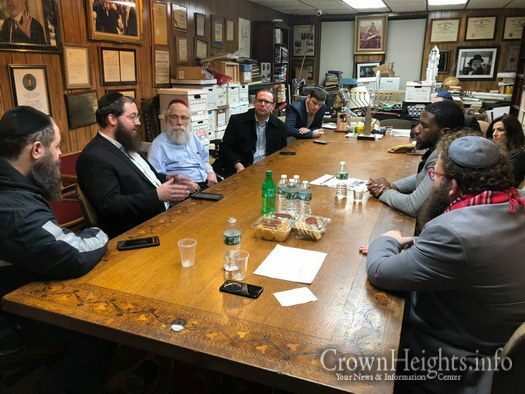 Rabbi Mordechai Lightstone, social media director for chabad.org also attended the meeting, as well as Rabbi Mendy and Gadi Herhkop, Coordinators of Crown Heights Shomrim. Also at the meeting were Mrs. Baila Olidort, Director of communications for Chabad Worldwide, Mr Shloime Hecht of Community Board 9, and Boris Noble a Staffer for Jumaane Williams. A primary topic of discussion was the housing changes and challenges affecting the chasidic communuty of Crown Heights. 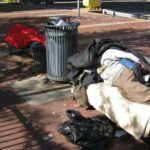 The alarming uptick in violent crime, as well as other security concerns were discussed as well. Al Sharpton’s good friend now wants to be our friend??!! Finally seeing the faces of those who actually care for the well-being of us the members of ch.